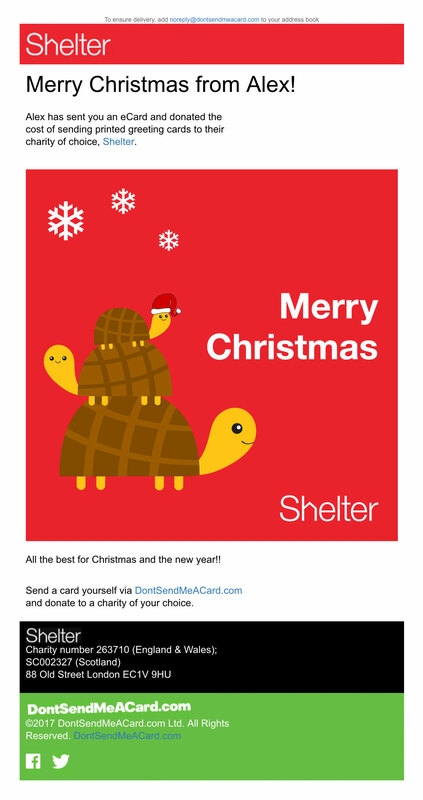 Shelter made full use of online greeting card alternative DontSendMeACard.com over the festive period, fundraising almost 90% more than they originally expected. The charity joined the ecard and donation platform in summer 2017, after agreeing upon additional custom requirements for their Christmas campaign. The objective was to be able to invite both individual and corporate supporters to send Shelter Christmas ecards and donate the cost of printed greeting cards, offering a Shelter branded experience. Shelter's expected donation amount was almost doubled, receiving an increase of almost 90%. Shelter are continuing to work with DontSendMeACard after enjoying an ROI of 386% from their first year. "It was a pleasure to work with DontSendMeACard.com for our Christmas e-cards campaign. The team are really friendly and helpful, which made launching our Christmas e-cards stress free. The e-cards tool also worked really well for our supporters and I'd recommend the tool to anyone." 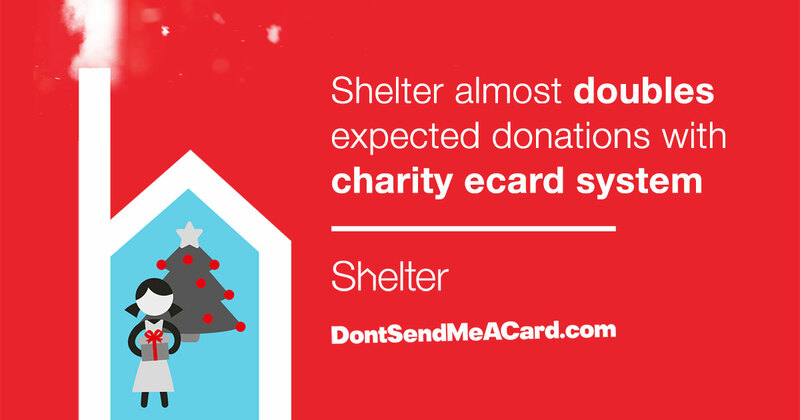 Working closely with the charity to ensure appropriate marketing intelligence was provided, DontSendMeACard helped Shelter understand how their marketing campaign performed through different marketing channels. Shelter were able to offer a corporate ecard page in addition to an individual page. This provided them with the ability to configure the donation amounts in relation to the ecard volume. Companies were then able to give and upload their own logo to be featured on the ecard, and send via CSV upload. A set of eight card designs were created following Shelter's brand guidelines, two of which were 'cinemagraph' looped animated GIFs. One of the custom requirements was to ensure that the recipients' ecard email maintained the Shelter look and feel. As a result, the entire process offered the right balance of a charity offering, powered-by the DontSendMeACard system. 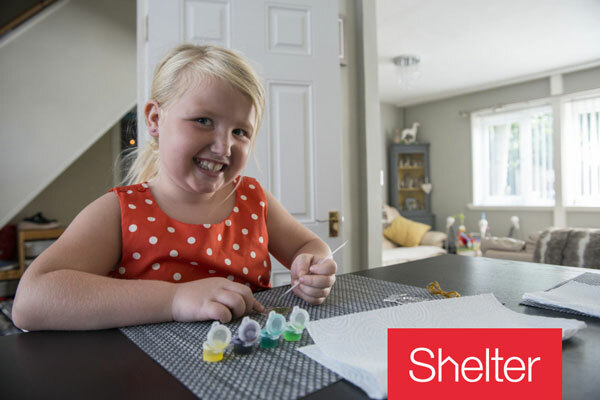 By using a system that has been fully developed and refined, Shelter removed the hassle of maintaining and supporting a new system internally. Using a proven technology also avoided the potential of a system failing at the crucial moment of fundraising and potentially disappointing supporters. 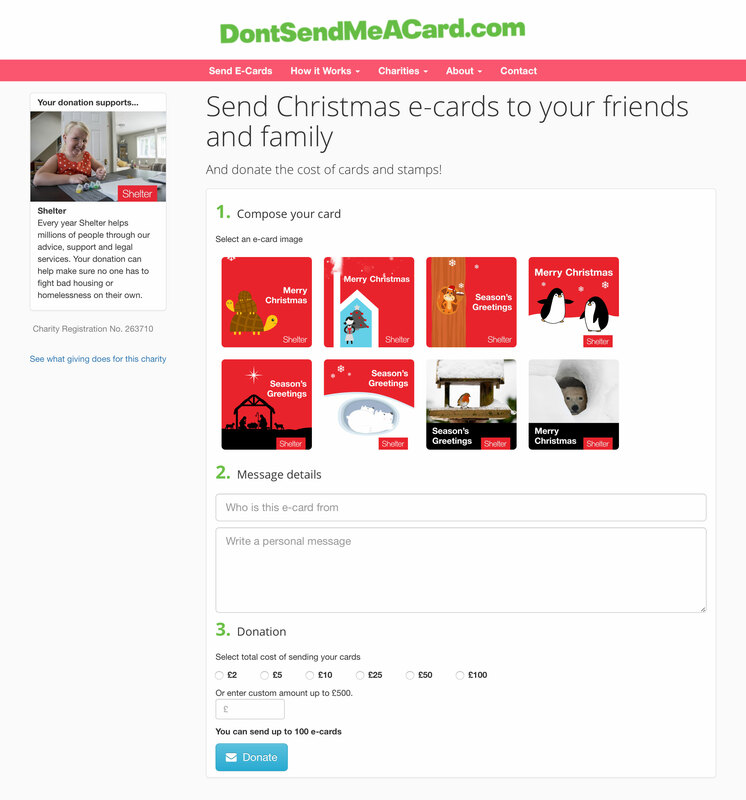 Mark Molloy reports in the Telegraph in December 2017 that the platform recently saw a 600 per cent spike in users giving, in his article People ditching Christmas cards for charity donations as part of 'Don't Send Me A Card' trend. 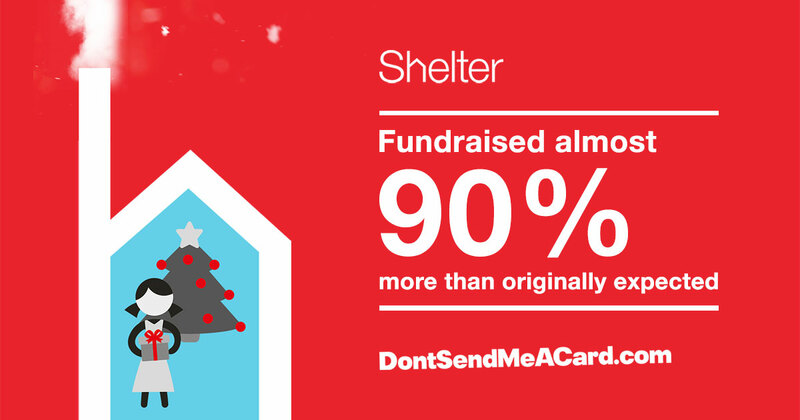 The success of this project for a large national charity demonstrates DontSendMeACard's ability to achieve a significant fundraising figure in lieu of greeting cards.